So I’m just riding along last night, out for a spin with a new wheelset, and a commuter charges up and says….wait for it…. While pointing at my bike. He was right, it is the OPEN, my brown bike, so I replied with a “Yup!” Then he rode away. Well, I guess that bike is famous. 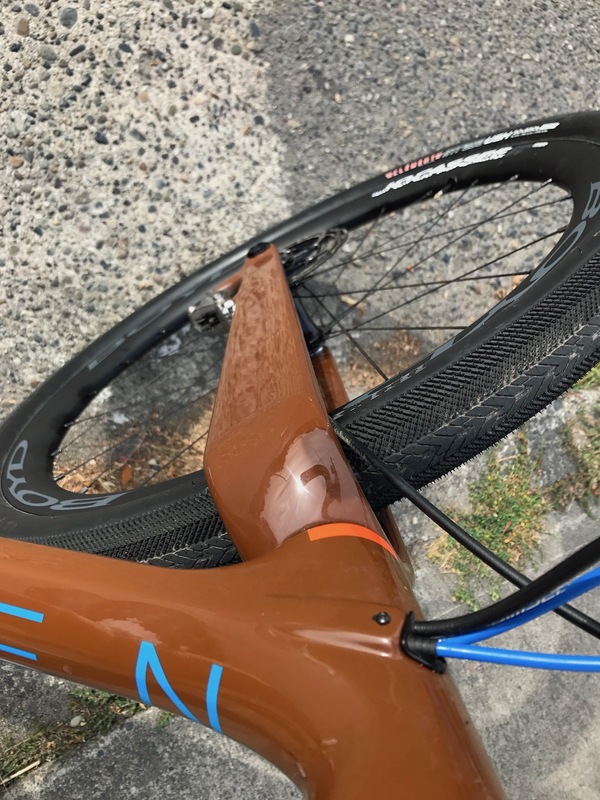 Maybe it was the new Boyd Cycling wheelset with pre-released Clement Stradas USH on it? Who knows, but that’s a good lede for an introduction to the Jocassee wheelset, which I wouldn’t recommend for the climbing days (735/876gr front/rear), but absolutely for the endurance category and when reliability is most important. That’s because Boyd Cycling is an American-based wheel maker and spec’d the Jocassees with White Industries hubs, Sapim spokes, and center lock rotors. That’s exactly how Mark V would build a wheelset. This is exactly how I’d build them. Nicely tensioned. 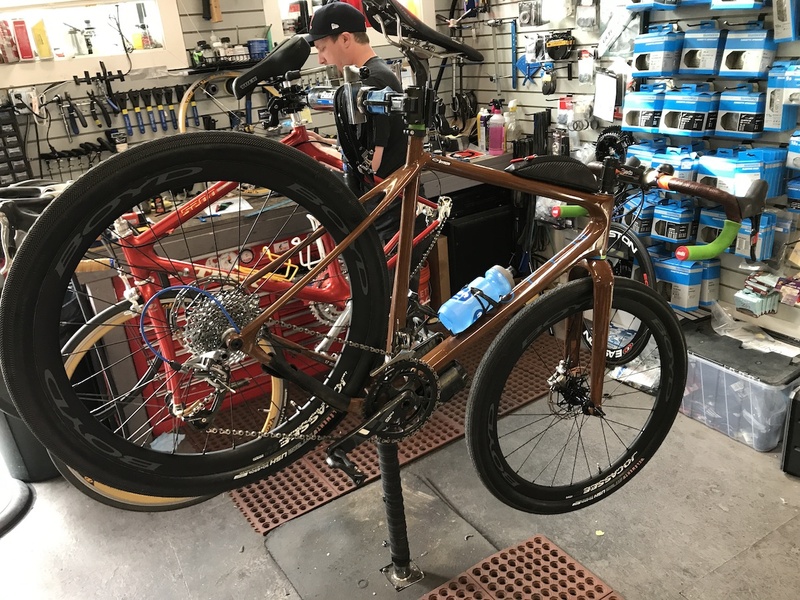 Wide internal width of rim ideal for 40-50mm gravel tyres, but it can make some actual mtb tyres in the 2.125-2.25″ range uncomfortably wide on gravel bikes like the Open U.P. It’s true that the new category of gravel tyres is rapidly filling with options in the 48-50mm range, but there is a widening gap between those and knobby treads in the 27.5 mtb tires, as many tire manufacturers blur the imaginary difference between standard mtb and the “27.5-plus” category. Whether or not that’s even an issue to the majority of potential buyers is hard to say, but I occasionally run Schwalbe Rocket Ron 2.25, so I have to be aware. But for a 48mm gravel tyre, these are perfect. Many wheel brands simply source their hubs from Asia, but if there’s one thing I consistently prefer as “American Made”, it’s hubs. Boyd is smart to offer that as an option alongside more budget-conscious choices. Meanwhile Sapim has quickly become the spoke of choice for wheel brands both small and large. With their selection of bladed spokes, it’s not surprising that Sapim is found on these wheels from Boyd. Depending on the build, these are priced under $2K, and there’s just nothing wrong with them. Everything right actually and they look fabulous on my bike. Good enough to draw looks from commuters at least.